and the chickens who lay them. Here are Queen Latifha and Sister in their laying boxes. 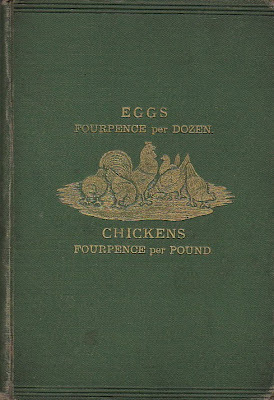 I also love old poultry books like this one explaining how to make a glorious living selling your eggs for 4 cents a dozen. Well, here in the US, it might have been closer to 6 cents a dozen. Or you can buy them today for $4 a dozen. I once heard Jane Goodall tell a story. 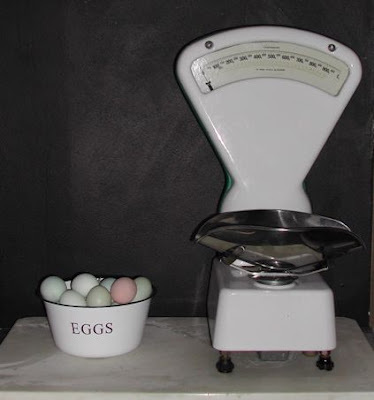 When she was 4 she was fascinated by how an egg could come out of a chicken, since there were no obvious holes big enough. She sneaked into the hen house and spent a whole afternoon waiting to observe. During that time her family thought she was missing and were panicking they way you would if your 4 year old had disappeared. At the end of her vigil she did indeed watch a chicken lay an egg, upon which she stepped out of the hen house with wonder on her face. Her poor panicked mother saw her come out and instead of yelling at her, she pulled her gently on her lap and said "Tell me what you've seen," because she could tell from Jane's expression that she'd had a profound experience. What a great mother she had. You must have misunderstood. I said eggs sell here for $1.25/dz. but that it COSTS $4.00/dz. to make the chickens lay them!